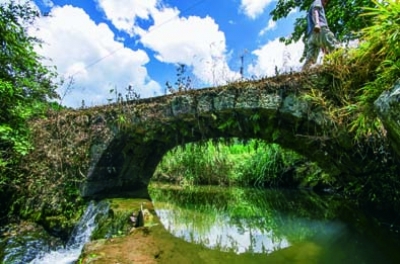 Moukanda Bridge is a flat-arched stone bridge over creek in Niwada area. The name "Moukanda" derives from the fact that the people from Moukano area worked together with people from different areas to cultivate the land (called ta or da in Japanese). Moukanda Bridge is 6.7 meters long, 1.8 meters wide and 1.5 meters high, and is designated as a City's Cultural Property.